Here's one way that old-fashioned newsprint beats the Internet. 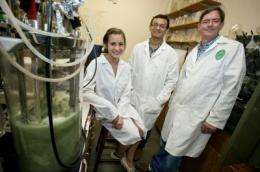 Tulane University scientists have discovered a novel bacterial strain, dubbed "TU-103," that can use paper to produce butanol, a biofuel that can serve as a substitute for gasoline. They are currently experimenting with old editions of the Times Picayune, New Orleans' venerable daily newspaper, with great success. plenty of straw, corn husk and wood chips out there... this solves the dependancy on oil and energy problem ... now lets see if they allow society to benefit from this one. Sounds like a farmer can make his own fuel from waste vegetation. This is great. So if this bacteria works on all plant bio mass, than that mean it can work on dead trees, grain stalkings, produce waste? The reason i ask is because i live on a farm! I would imagine that the hard part now is to find the ideal conditions for this bacteria. Most likely, the buildup of the butanol would inhibit or even kill the bacteria that are producing it if too much accumulates. A fine balancing act of temperature, feedstock, bacteria counts, moisture, surface area, and butanol levels would have to be found for this to be done in any sort of large scale process. Oh good, the liberals now have another reason to raise taxes; subsidize the newsprint and newspaper businesses as too big to fail, so we can use the used newsprint to fuel our cars. Why don't we just cut down the trees directly? Our cars can run on a lot of things. The issue isn't just reducing and eliminating our dependency on foreign oil. It's that we need to figure out a way to create renewable sources of energy, rather it be solar or hydrogen or fusion. It seems like a waste of time and resources to spend so much time on band aids when we all know what we should be focusing on. Actually energy independence is a very good and worthy short term goal/motivator. It will get us to sustainable energy quicker than just shaking your finger and saying, "we all know what we should be focusing on". Because even if everybody agreed on what we should be focusing on (which they don't), there has to be the economic driver, and right now internal U.S. industry would be a big boon in many ways. You know how much yard waste people dispose of every year? Not to mention agricultural bi-products.(!) A business could probably convince people to pay them to take it away (or pay them nominally), then turn it into fuel, or sell it to someone who can, and profit from it even more. As scottingham alluded to though, it's efficiency and scalability will determine it's viability as a mainstream energy source. I think you should go live on Easter Island. Energy is a form of wealth. In fact, as currencies go, its among the most useful and universal. If individuals are allowed to use this process, it will not only help solve energy problems, it will re-invigorate the economy by helping to offset the concentration of wealth. Unlike solar and wind, it creates a form of energy that is portable and exchangeable. I think the idea in the article is a good one. Seems like it could scale up nicely, too. The issue isn't just reducing and eliminating our dependency on foreign oil. It's that we need to figure out a way to create renewable sources of energy, rather it be solar or hydrogen or fusion. - Fusion isn't a renewable power source. That could actually be the main thing. Depending on how much the average household could get out of a small bioreactor under the kitchen sink.